Why does my dog need to be evaluated in person? During the initial pre-boarding consultation, we learn about your dog‘s unique needs. We ask questions about her social, medical and behavioral history, her likes and dislikes, special handling needs, and care requirements. We also assess how she responds to the Citizen Canine environment. We use this information to place dogs appropriately in playgroups, and to better meet your dog‘s individual needs while she is staying with us. We also give you a full tour of the facility and answer any questions you have about any of our services. This short trip to our facility also gives your dog a chance to “sniff us out.” Having a positive experience during the initial consultation helps assure your dog that Citizen Canine is a safe and fun place to visit. If your dog has never boarded before, or has a history of separation anxiety, we may require a trial overnight in advance of a long stay. Citizen Canine offers a highly interactive boarding experience where your dog will socialize with many people and dogs on a daily basis. This is not a safe or appropriate environment for all dogs, and in some cases, we may refer you to a different service that better suits your dog‘s needs. My dog has never boarded before. Will he be OK? Many of our guests are first-time boarders. If your dog enjoys the company of other dogs, the daily playgroups are a great outlet for the anxiety caused by being away from home. We offer love and t-touch sessions for dogs that need some extra human TLC to help them feel comfortable. It is not unusual for dogs with separation anxiety to stop eating: we monitor all meals and will add tasty treats, hand feed, or sit with dogs during mealtimes to make sure they do not miss too many meals. If you are planning a longer vacation, we also recommend (and sometimes require) a trial day care or overnight stay to help your dog acclimate to our environment and routine prior to an extended stay. My little dog is terrified of big dogs. How will he be made comfortable? We love little dogs! Our smallest guests stay in double-bunk rooms in a separate area of our facility, away from the big dogs and closer to the flow of human traffic. They play in their own small dog groups and they always have a great time! My dog is from a shelter. Will he think I‘m abandoning him again? Our environment is very different from most shelters. At Citizen Canine, dogs stay in a home-like environment and receive lots of individual attention and playtime outside with other dogs. A good percentage of our dogs are rescues or come from shelters, many from Hopalong Animal Rescue or the Oakland SPCA. These dogs adapt very quickly and love coming to “camp” to see their friends. If you are unsure about how your dog will feel, why not schedule an appointment for trial daycare so that your dog can meet the staff and learn the ropes? 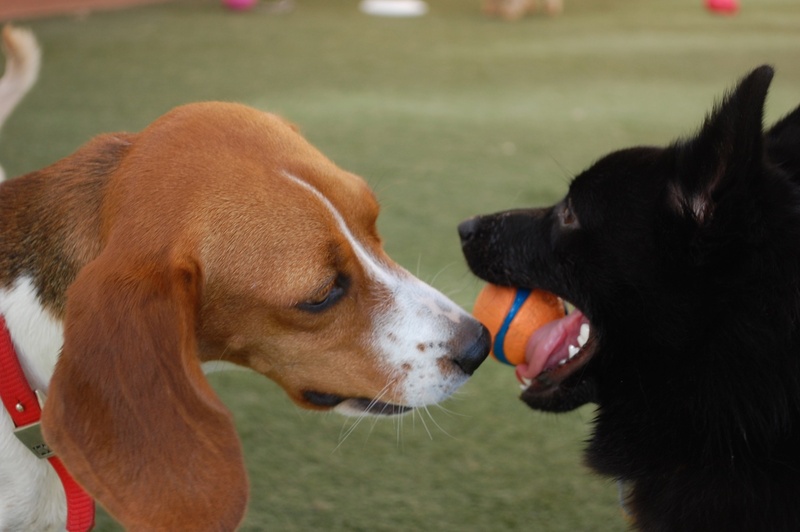 Dogs are assigned to playgroups with 4 to 10 other dogs of similar size, age, and play style. Young puppies and rowdy adolescents have their own groups where they won’t pester the older dogs. Senior citizens also have their own group where they won’t be jostled by the more active dogs. Small dogs always play separately from the big kids. Each play group is carefully monitored by a staff member trained in reading dog body language and using dog-friendly methods to encourage appropriate play behavior. Play sessions last about 30 minutes each. We monitor groups so that dogs get adequate exercise without overdoing it. What if my dog doesn’t play with other dogs? Some dogs cannot play with other dogs for medical reasons, such as a joint or back injury, in which case they may go out for their daily outings with a human companion on our Private Play program. Due to the additional time and attention involved, the Private Play program is an additional $20/night. However, dogs that are not well-socialized to other dogs and exhibit fearful or aggressive behavior towards other dogs are usually not appropriate guests for our facility. Our staff trainer will determine a dog's suitability for our Private Play program during the initial pre-boarding consultation. How old does my puppy need to be to stay at Citizen Canine? Puppies must be at least 16 weeks old and have received at least two puppy (DHPP) shots and a Bordetella vaccination (rabies vaccinations are not required for young puppies until 6 months old). My dog is not spayed/neutered but loves other dogs. Why can’t s/he stay? Intact pups up to the age of 7 months may stay with us and play in our puppy playgroups. However, once pups reach the age of 7 months, they must be spayed or neutered in order to continue to board, and attend. Both intact males and females begin a surge in hormones around 7 months changing their interactions with other dogs. Intact dogs become more interested in territory marking, mating, and ranking behaviors that raise the potential for conflict in a playgroup situation. Even if these dogs are very friendly and social, they can be seen as a potential threat by other dogs, and thus have a higher potential to provoke aggression in a play group simply due to their intact status. Intact females can enter a heat cycle at any time while staying at Citizen Canine and provoke unwanted and potentially unsafe behavior from other dogs who are keenly aware of the presence of an intact female in the facility. What type of training do you do at Citizen Canine? We use positive reinforcement techniques to teach dogs what behaviors are appropriate. We reinforce the desirable behaviors (such as sitting politely) with praise and food rewards and we ignore behaviors we don’t like (such as jumping up on people). We also use praise and treats to create positive associations with objects and experiences that dogs may otherwise find frightening or uncomfortable. We do not use adverse measures to punish behavior. Our training techniques are fun for both people and dogs, strengthen the human-animal bond, and create dogs that love to learn! We can recommend classes and workshops that can teach you how to work with your own dog, and we offer staff training sessions with boarding and day care dogs to complement the work they are doing at home. I am concerned about my dog‘s health. Our service is designed to maintain optimum health of our guests. We require each dog to be vaccinated before boarding. We also keep the environment as low stress as possible and follow have a regular schedule. A low-stress environment and regular schedule help support the immune system and keep dogs healthy. Each room is also individually ventilated which helps prevent the spreading of disease. If a health concern should arise, we have relationships with several local veterinary clinics and emergency hospitals, as well as a visiting veterinarian. Depending on the situation, dogs may also be brought to their own veterinarian for treatment. We will always contact the owner in the case of a medical problem requiring veterinary care. We require that all dogs that come for boarding or daycare be free from any pests or parasites. Approximately 80% of our clients use Advantage or Frontline. 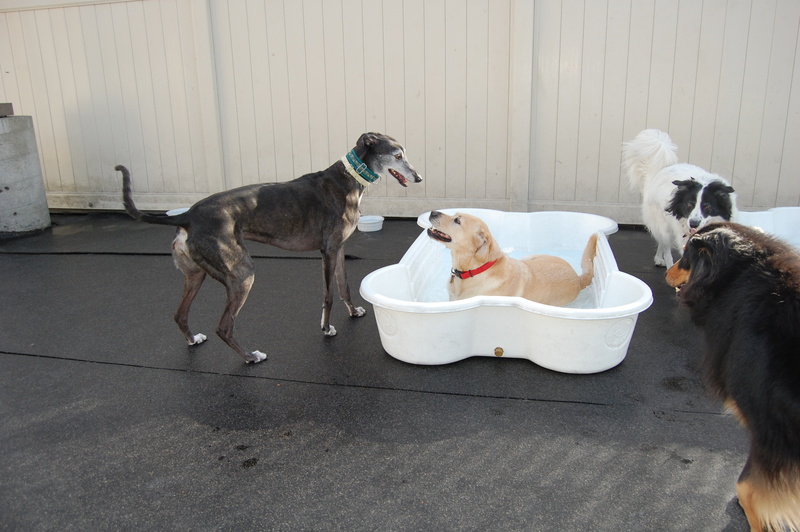 Even though the indoor surfaces and cleaning methods at Citizen Canine are not conducive to flea development, our guests do play in an outdoor space and interact with other dogs. If you are concerned about flea and tick infestation, we suggest you treat your dog with Advantage or Frontline prior to your dog‘s stay at Citizen Canine. How far in advance do I need reservations? Our busiest times of year are holidays and the summer months, where we fill up 3 - 6 weeks in advance. We recommend you make your reservations well in advance. We require 72 hours notice for your cancelation of reserved stays. What should I bring for my dog‘s stay? For safety reasons, your dog should be wearing only a flat or limited slip collar, not a metal collar or chain. Lupine brand collars and Premier brand limited slip collars are available for purchase in our retail area. All our guests are provided with raised beds and blankets free of charge. You do not need to pack any bedding for your dog, but if you choose to do so, please make sure it is machine washable and labeled with your dog’s name. We discourage you from bringing toys that are not safe for unsupervised chewing. Sometimes personal items go missing in our laundry, so please do not pack anything you can’t bear to part with. It is helpful to us if you can bring pack dry dog food in individual baggies for each meal (2x/day). You are welcome to bring special treats for your dog which we will serve at lunch time. Our staff offers dogs various types of food rewards during the day. If your dog has food allergies or sensitivities, please pack a supply of whatever non-perishable training treats you use at home. For every trip, we will ask you for updated emergency contact information at check-in. Will my dog lose her housetraining habits? No! Dogs staying at Citizen Canine quickly adapt to our routine and learn to use the K9 Grass potty areas in the yard as their bathroom area. For adult dogs, 4 trips outside between 6 am and 9 pm are usually plenty to keep up their training. Can my son or daughter volunteer to pet the dogs? We are sorry but our insurance does not cover volunteers. However, both the Oakland SPCA and Berkeley Humane have excellent volunteer programs for adults and kids. What if my dog has special needs? We can accommodate most special medical needs, including administration of medications, pills, and eye and ear medications. We are familiar with the special needs of blind dogs, deaf dogs, dogs with spine, hip and knee problems, epileptic dogs and very senior citizens. We cannot administer injections for diabetics. We cannot accept any dogs with contagious illnesses for the health and safety of our other canine guests. Please bring any medications in separate, clearly marked containers (do not pre-mix medications into your dog’s food!!!). Also, please be aware that there are inherent risks in boarding a senior dog. Underlying health problems can be exacerbated by stress, and illnesses or infections, which would be minor in a younger dog, can become serious and even life threatening in an elderly or frail dog. Owners of senior dogs should give us clear instructions about their preferences for medical care and intervention. Can I call to check on my dog? Of course! We welcome your calls during regular business hours, and we are always happy to give you a report on how your dog is doing with meals and playgroups. We also check our e-mail frequently and are happy to respond to your questions via e-mail. When can I check my dog in and when can I pick her up? Citizen Canine is open 7 days a week. Your dog can arrive for check in anytime between 7 am and 7 pm on the day your reservation begins. Dogs can check out between 7 am and 10 am (no charge for that day), between 12 pm and 7 pm (daycare charge for that day), and between 7 pm and 9 pm (daycare charge plus after hours check out). All guests must be vaccinated for Rabies, DHPP, Bordetella, and Canine Influenza H3N8. Rabies is required every 3 years by law. Puppies must have a minimum of 2 rounds of DHPP vaccinations prior to staying with us. Distemper/Parvovirus boosters or titers are required every 3 years, or according to your veterinarian’s recommendation. Bordetella is an intranasal vaccine for canine cough that should be administered at minimum 7 days prior to boarding. We require Bordetella vaccines be updated annually, but many veterinarians recommend vaccinating every 6 months if your dog is in regular social contact with other dogs. Similar to a flu shot, this vaccine covers only a few strains of canine cough and is not a guarantee of immunity. Please provide us with copies of your dog’s vaccination records or ask your vet to fax them to us at 510-562-0132. Many dogs have two guardians with different last names. Please make sure the owner name on your vet records matches the owner name on our client records. For dog care news and updates delivered to your inbox! Make Traveling Convenient With our Park and Bark Program. Visit AirPark to find out more!